1. Preheat oven to 400°. Prepare rice as label directs. 2. Meanwhile, in medium bowl, toss tomatoes, garlic, onion, olives, jalapeños, capers, oil, oregano, and lime juice and zest until well combined. 3. Cut four 15 x 18-inch sheets parchment paper. Place 1 sheet parchment on work surface. 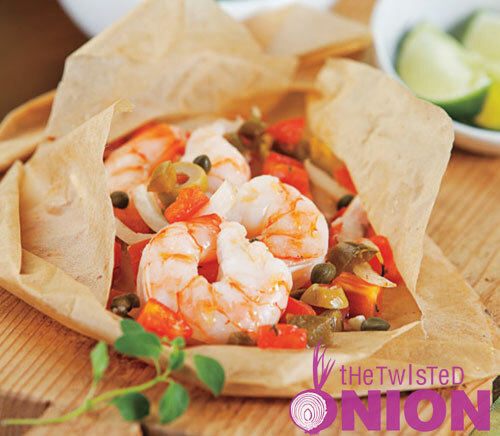 Arrange about 1 cup of tomato mixture on half of parchment sheet; place 1/4 of shrimp (about 7 shrimp) over tomato mixture. Fold parchment over to cover shrimp and tomato mixture. Fold edges several times to seal tightly. Repeat with remaining parchment sheets, tomato mixture and shrimp. 4. Place parchment packets on rimmed baking pan. Bake 10 minutes or until shrimp reaches an internal temperature of 145° and turns opaque throughout. With kitchen shears, cut an X in top of parchment packets, then carefully pull back parchment to open. 5. To serve, evenly divide rice over 4 dinner plates, then pour 1 packet over rice. Packets can also be prepared with foil instead of parchment paper. Grill packets, covered, over medium heat for 10 minutes.